The striking cut of this dress has a goddess-like vibe, and the contrasting gold band adds a touch of unexpected shimmer. The Gold Streak Plunging Neckline Maxi Dress is fully lined to the mid-thigh and is made of chiffon. The top part is made of pleated chiffon and has wide shoulder straps and a plunging neckline. Horizontal gold elastic bands decorate the bust and create the empire waistband. The same bands form a crisscross 'x' design at the back. This dress has a full length maxi cut and is lined to the mid-thigh. An exposed back zipper completes this dress. The Gold Streak Plunging Neckline Maxi Dress could be dressed up with gold metallic heels and a clutch for an upcoming dance, prom, or formal event. 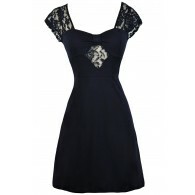 You could also dress it down with flat beaded sandals or wedges for a casual glam style. Details: Lined to mid-thigh. Exposed back zipper. 70% silk, 30% polyester. Lining: 100% polyester. Hand wash cold water separately. Color will bleed. No bleach. Hang to dry. Small measurements: Length from top of shoulder to hemline: 57". Bust: 33". You have added Gold Streak Plunging Neckline Maxi Dress in Teal into Wishlist. You have added Gold Streak Plunging Neckline Maxi Dress in Teal for Stock Notification. 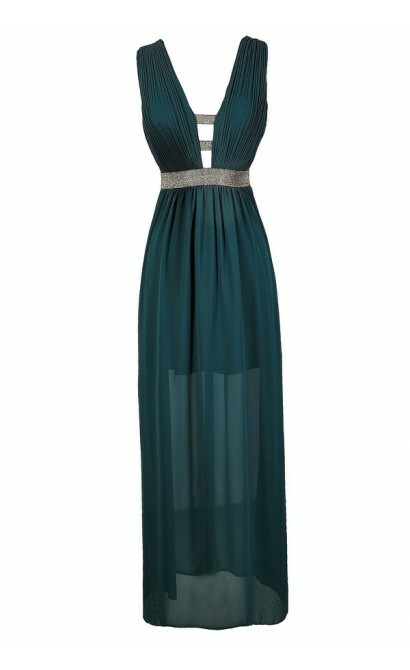 You have set Gold Streak Plunging Neckline Maxi Dress in Teal as a loved product. You have removed Gold Streak Plunging Neckline Maxi Dress in Teal as a loved product.